HomeCelebsPriya Prakash Varrier memes are making it big on the Internet and here's why! This adorable girl's winking expression is driving many absolutely crazy! Today, we've come across a girl who has made it big on the Internet simply with her charm and her adorable little wink. Not sure who and what we're talking about, right? Let us elaborate. 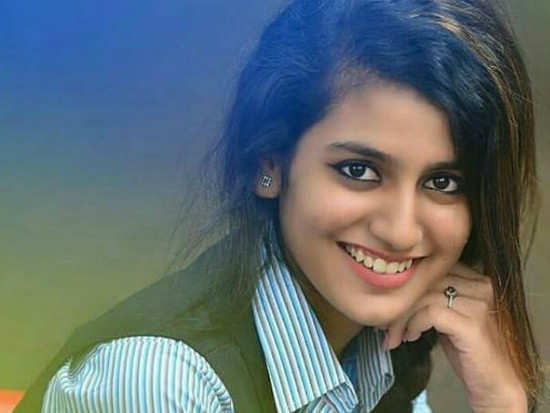 Priya Prakash Varrier's clip from her debut movie has gone viral and trust us, you’ll want to know why. The clip shows the girl raising her eyebrow at a guy and then winking at him and her expressions have got the boy swooning all over her in minutes! Priya has now become an Internet sensation and we just had to bring her to you! The South Indian actress' winking clip is from her debut film, 'Oru Adaar Love' and will release on 3rd of March 2018. And we bet you're just dying to catch the film. However, before that, we've got something even more interesting! What's that, you ask? Memes and jokes, of course! Her photos have been spamming several news portals and social media platforms. The school-crush theme with Priya winking has made the Internet crazy and like always, social media users have decided to go with memes on the topic. And to give you a rough idea of her popularity, she has gained more than 400 thousand followers on Instagram and 50 thousand likes on Facebook in less than 8 hours! Go on...take a look at the memes and kickstart your Monday with a hearty laugh! Well, she sure has made it big on the Internet over night! After Twitter, Abhishek Bachchan's Facebook and Instagram account gets hacked! EXCLUSIVE: Manoj Bajpayee: How can I take a dig at Akshay Kumar? Kim Kardashian West slammed for North taking a half-dressed picture of her! Deepika Padukone reveals her Valentine’s Day plans and they’re not what you expect them to be! Is this who Alia Bhatt is dating? 1Priya Prakash Varrier memes are making it big on the Internet and here's why! 4After Twitter, Abhishek Bachchan's Facebook and Instagram account gets hacked! 5EXCLUSIVE: Manoj Bajpayee: How can I take a dig at Akshay Kumar? 6Kim Kardashian West slammed for North taking a half-dressed picture of her! 9Deepika Padukone reveals her Valentine’s Day plans and they’re not what you expect them to be! 10Is this who Alia Bhatt is dating?